Description of " vyakti nam sanskriti ke samvahak"
Normally, Personal Names are carrier of culture. They are not only the expression of human civilisation but also the authentic documents of it. Personal Names like a heading of an essay who elaborates the story of Names in a beatiful prose. 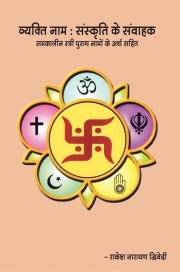 This book tells many aspects about Personal Names, which do not know otherwise. Different type of lists of Personal Names with their inherit meanings is also given in annexures. Reviews of " vyakti nam sanskriti ke samvahak"